These sort of comments prompted me to look up some statistics. 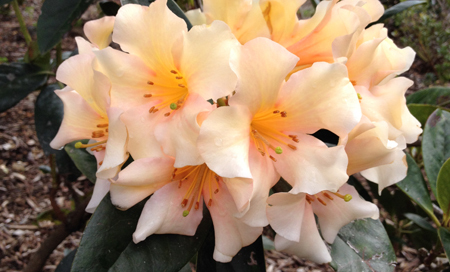 The National Rhododendron Gardens cover 40 hectares. Compare that to the Royal Botanic Gardens, Melbourne 35 hectares, the Royal Botanic Gardens, Sydney 30 hectares and Mt Tomah Botanic Garden 28 hectares. Furthermore, my wife and I have visited many high profile gardens around the world and I can truthfully say that the NRG can hold its head high with the best of them. For example, the Butchart Gardens on Vancouver Island, British Columbia are renowned world wide. They occupy 22 hectares and in my personal opinion the NRG is a better garden (other than in the on site buildings). Nor is the garden just a rhododendron garden. While rhododendrons certainly play a central and dominant role there is a wealth of other plant material of botanical significance. It can very justifiably claim to be a cool climate botanical garden.